Klingons, rejoice! Now you can learn to speak Klingon like a "Star Trek" warrior with Duolingo online. For those getting ready for their next trip to Kronos – the homeland of the fictional Klingons in "Star Trek" – the popular language-learning site Duolingo now has a course in Klingon. Some of the phrases learners will memorize include "The Klingon does not understand English" (Dlvl’ Hol yajbe’ tlhIngan) or "Success and honor" (Qapla' batlh je! ), according to StarTrek.com. The lead course creator, Felix Malmenbeck, told Mashable that the new course will "lower the barrier to entry" for fans because it offers a regular, structured curriculum for anyone interested in the language. There are other ways out there to learn Klingon as well, ranging from in-person meetups to numerous books to the online Klingon Learning Institute. Notably, the newest Trek series, called "Star Trek: Discovery," has put a large emphasis on Klingon speakers in its story. 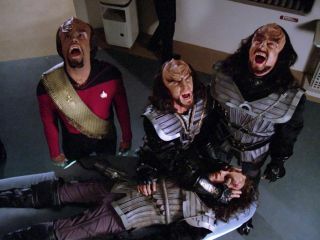 It also delved into the conflicts between the Klingon houses. Duolingo was founded in 2009. The Pittsburgh-based firm offers dozens of real-life languages to aspiring learners; for English speakers interested in picking up a second language, its offerings include diverse languages such as Welsh, Romanian and Vietnamese in addition to popular languages such as French, Italian and Spanish. This isn't Duolingo's first foray into artificially constructed languages – the website also offers Esperanto (a constructed language invented by L. L. Zamenhof in the late 1800s) and High Valerian for "Game of Thrones" fans. You can see Duolingo's crash course in Klingon here. We wish you success and honor. Qapla'!